I posted this on Hacker News. Follow the conversation here. For the past 3 months I was privileged enough to be a part of the 500 Startups Team as an intern. How did I get that much-coveted job? It’s a long story involving a Startup Grind hustling mission, 500 cookies, an InternMatch application, 3 interviews, 500 re-tweets, and a Quora answer. But that’s for another day. This is about my time with 500. On my first day, Christine Tsai, Partner at 500 Startups, handed me a welcome packet. In it were a few administrative and instructional things along with a section on the 500 Startups culture. So what does the 500 Startup culture exude? The culture that 500 Startups fiercely tries to preserve and promote has the characteristic of being “authentic, creative, innovative, collaborative, supportive & transparent”. It is a place where mistakes and failures are ok. You’re encouraged to learn from those experiences, move on, and become better. Here, you’re always encouraged to learn as well as teach. It’s a culture with a pay-it-forward mentality. And most importantly, it’s a culture that encourages working hard, but always having FUN. Every single part I read in that portion on the 500 culture I have witnessed to be true. 500 Startups make a lot of effort to cultivate, enforce, and preserve this culture of fun and collaboration. Christine heavily scrutinized and considered cultural fit when she hired me and I’m sure she and the rest of the partners heavily weigh in cultural fit when hiring other team members, inviting mentors, and selecting companies. But why is cultural fit so important when building a company? And why is it necessary in an accelerator? This heavy emphasis on culture has a highly positive influence on their investment companies. A culture like this fosters innovation. It’s extremely advantageous as an entrepreneur to have access to a strong network of smart people, but it’s even more important that everyone in that network is willing to help each other. One of the greatest values an accelerator provides is not just access to money, but also access to great people. Repeatedly, I see instances where a founder would shoot a message out through our internal communication system asking for an intro to someone or advice on a situation, and within minutes, there are several responses offering help and advice on the matter. That has tremendous value in an early stage startup where time is scarce and you’re constantly executing in the unknown. It helps to have a welcoming and easily accessible place where you can get assistance from people who have been there and done that. It’s highly advantageous for an accelerator to have a culture where mistakes and failures are accepted and not punished. This will allow people to take risks and be creative. You can’t experiment and push for innovation without making some mistakes along the way. This is the reason why Silicon Valley is looked to all over the world as the success model where technology, entrepreneurship, and innovation to thrive. This is why 500 makes it a mission to tell their founders that mistakes are okay. Fail fast. Fail often. It’s extremely beneficial for a company to provide an environment of fun. Fun is very good for company morale. Fun keeps people loyal and motivated. Entrepreneurship is an exhausting and crazy emotional roller coaster ride, but the element of fun makes it bearable. When someone loves their job, they are a lot more loyal and productive, and an environment of fun attracts smart and creative talent. I learned a lot at 500. I picked up tips and tricks on pitching, design, distribution strategies, and listened in on conversations about fundraising, but I also had a lot of fun. I got to be completely creative, do a lot of bad Photoshop editing and call it work. I was encouraged to be myself and implement my personality into the social media community management work. I got to jam to gangster rap with Paul, get life advice from James, and hear early days stories of 500 from Melissa. I danced to Baby Got Back with a bunch of crazy geeks along with Dave, George, Bedy, Christine, and Christen. I got to attend 500’s events and hear some very educational yet very quirky and hilarious presentations. I got to be a part of 500 and it was AWESOME! I know for a fact that the 500 accelerator companies work really hard but they also have a tremendous amount of fun. If you’re going to spend the majority of your time working, love it, and have fun! It’s impressive how 500 Startups grew to have of such an extensively large, diverse, multinational network of talent while still preserving this amazing culture and tight-knit sense of family. It’s a great dynamic that stems directly from the personality of the partners themselves and trickles out to the rest of team and family of founders and mentors. When building your company, you too should heavily scrutinize company culture. Because once it grows, culture is damn hard to fix. The toughest mission Marissa Mayer has as the new CEO of Yahoo is modifying Yahoo’s company culture. Remember this, take it into consideration, and hire very carefully. During my short 3 months with 500, a lot happened. The firm turned 2 years old, received its first very big exit with Wildfire, launched the WIN Initiative, opened an application process, added Mexican.VC, threw a bunch of awesome events, added a bunch of great companies to their portfolio, and made several strategic hires. All of this while the team is still composed of less than 20 people, not all of which are full time. 500 moves fast. They’re a team of straight hustlers and they invest in companies that hustle hard. But can you really expect anything else when Dave McClure is the founding partner? This week is my last week here. As I’m writing this, I can hear one of the accelerator companies discussing features while there’s a conversation about marketing coming from another corner. I look around and almost everyone else has his or her eyes glued to their computer screen. The beautiful bluish-pink Mountain View horizon sits on the backdrop and I can see the NASA Ames Center not too far away. There’s a pleasant tranquil atmosphere around the office today. It’s nice. I’ll miss this place. I’ve spent a wonderful 3 months here. Everyone has been asking me this week what will happen after my term is over. Where will I go? What will I do? I don’t know. I’m not entirely sure. Frankly, I haven’t decided yet. I’m not at all worried about the future though. I’ll be fine. I’ve been indoctrinated into the 500 family and will take this lesson in community and culture with me. I’ll figure things out, fail, learn, pivot, innovate, and adapt. 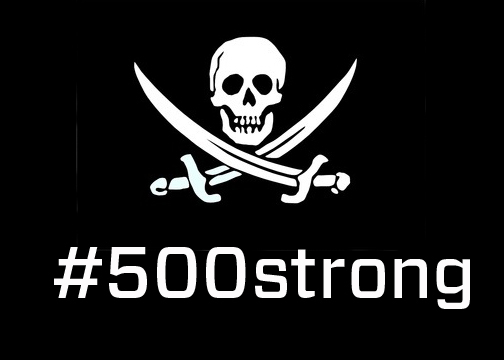 After all, I’m #500STRONG.